WINNIPEG -- Manitoba has appointed five new people to the Manitoba Hydro board after all but one member quit en masse earlier this week. Crown Services Minister Cliff Cullen says three women and two men will join backbencher Cliff Graydon on the Crown corporation's board. He says Marina James, chief executive officer of a Winnipeg real-estate association, will be the chair. Michael Moore, who was recently head of the province's home builders association, has been appointed vice-chair. The other board members are Indigenous filmmaker Lisa Meeches, Bell Canada lawyer Melanie McKague and former aerospace operations director Wade Linden. "Our government wishes to thank the outgoing members of the Manitoba Hydro board for their service and for the work they have done on behalf of all Manitobans, and recognizes the significant challenges that they were met with in terms of the financial position of the corporation," Cullen said in a statement Friday. The chairman and eight other board members quit on Wednesday. They said they had been unable to secure a meeting with Premier Brian Pallister for more than a year to discuss key issues. 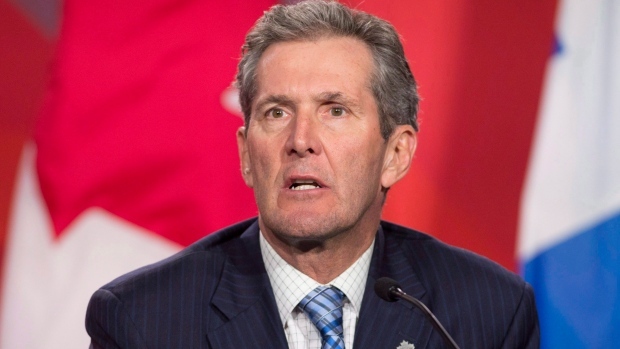 Pallister said the dispute stemmed from the board's plan to pay the Manitoba Metis Federation $67 million over several decades so the organization would not oppose current projects -- as well as some future domestic transmission lines -- for up to 50 years. Former chair Sanford Riley said the settlement made sense in light of recent court rulings that have supported Metis rights. He also argued the payment could be lower than the cost of legal challenges and compensation for upcoming Manitoba Hydro projects. The government quashed the deal calling the settlement "persuasion money." Pallister argued the next generation of Metis might want the right to seek regulatory reviews or question future projects. David Chartrand, president of the Metis federation, accused Pallister of using "race card" tactics and said the money was partly to compensate for land cleared for hydro poles. James said in a statement that her new role as chairwoman provides an opportunity to tackle the challenges that face Manitoba Hydro. "While I will not comment on the statements made by my predecessor, my priority is to have an open dialogue with the minister of Crown services," she said. The new board appointments were criticized by Grand Chief Sheila North, who represents northern Manitoba First Nations. North said there was no consultation and, as a result, there is no representative on the board for her people. "It is the First Nations communities in the north that experience the greatest effects from Hydro's short-term and long-term decisions," she said in a statement. "This was an opportunity lost by the premier."